In this modern day and age technology plays a major role in the growth and development of a business. So it perhaps comes as no surprise that business managers prefer email marketing, a more advanced and faster messaging system to text message marketing. However, there is more to it than you think. Emails are delivered instantly, but according to recent studies not all people have access to email services. This means that despite being an older medium, SMS marketing remains a more effective medium for transmitting messages. Let’s take a detailed look at how text message marketing continues to outgun email marketing. The only thing that you need to send a text message is a cell phone. It is simple and effective unlike email messages. In order to send or receive email messages you need a computer or a smart phone. Plus you also need internet access otherwise you won’t be able to perform these functions. On the other hand, text messages are super cheap and most cell phone service providers give bundle deals to customers. Messages are also sent and received instantly given the fact the almost everyone carries their cell phone along with them everywhere. This is a primary reason why text message marketing is more powerful than emails. According to experts, on an average basis most emails are spam. This means that emails that are genuine are still overlooked given the vast majority of spam emails. The statistics are out there to prove these facts. Recent studies claim that 90% of the emails received by an average user are spam while only 1% of the text messages received are spam. This creates a huge difference between the two mediums and clearly gives SMS marketing the edge. It perhaps comes as no surprise that market trends are shifting and moving towards mobile marketing. Experts believe that most effective communication occurs when the messages are kept short and simple. This term “kiss” (keep it short and simple) was coined to tell people the importance of being concise. 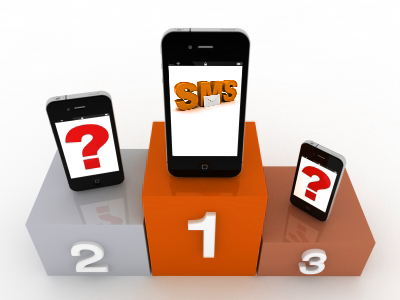 SMS marketing is always to the point and straightforward. The clarity of the message is what makes it so effective. On an average basis 98% of all text messages are read whereas only 22% of all emails are read. The benefits of text message marketing clearly outweigh those of email marketing. Any business manager should consider this medium in order to enhance their business operations.